“WIRE” My Orthodontists Asking Me to Eat Ice Cream? We all wish (both patients and orthodontists) that teeth could magically go from crooked to straight over night. This is not possible however as teeth are part of a biologic system (the human body). The forces used to move teeth must be physiologic, which is a fancy word for light enough and consistent enough to allow for a safe and timely response of the teeth, especially during the early stages when teeth are their most crooked. 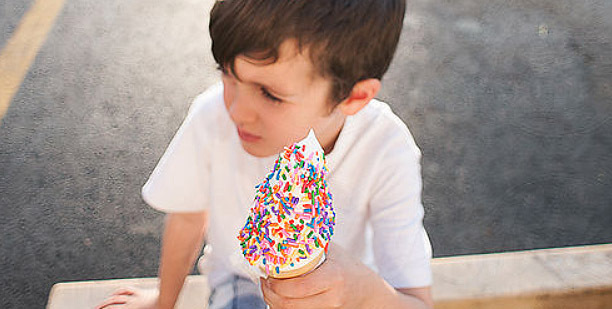 It is not uncommon for orthodontists to request that patients undergoing comprehensive treatment (a full complement of braces) periodically eat ice cream during the early stages of the tooth aligning process. Believe it or not, there is science behind their making this request. And that science is in the wire or arch wire used to align the teeth….. let me explain. Enter (drum roll please)… the Copper-nickel-titanium (CuNiTi) wire/archwire. This extremely flexible wire is manufactured in a shape or form that is relatively close to the desired shape of an aligned dental arch. The goal of such wires is to utilize its flexibility to get the very crooked teeth safely to the right neighborhood. Once there, the more rigid finishing wires are utilized to make sure the teeth park in the right driveway (a discussion for another day). The cool (pun intended) thing about CuNiTi wire is that when it is chilled to a temperature at or below room temperature it forgets what shape it was made in or should be in and sort of becomes a spaghetti noodle that can be easily bent, pushed or folded in any direction. As temperatures rise and return to a level similar to that under which the wire was made, as would be the case in the mouth (normally 98.6 degrees F/ 37 degrees C), the wire starts to remember its original shape and begins to apply force to the teeth as it tries to straighten itself out. In essence, the introduction of ice cream to the mouth allows the wire to easily and repeatedly re-engage the braces into which it is attached. As the mouth warms up, and your ice cream headache disappears, the “recharged” springiness associated with the wire is applied to the teeth and Voila….the teeth move. So the next time you are prescribed a weekly ice cream regimen by your orthodontist, know you are not only helping your taste buds but your orthodontic treatment as well!